I’m devoting the 3-day weekend to writing — which means no blog posting (except this). No sign of the Lawnmower Man yet — perhaps he’s taken his family to the beach. Or to the park for a cookout. I had feared that everyone would be in their back yards (it’s a condo complex, with one continuous back yard for all), hootin’ and hollerin’ and barbequeing. But no. Nice and quiet. Not too hot. Nice for writing al fresco. Just to let people know: the auction for Laurie & Deb went swimmingly, and the total has come to more than $10,000. If YOU participated, you are wonderful, and we all love you. The book, and the book plus artifact, are now winging their way to their respective new owners (Australia? Did you say AUSTRALIA??). I had tried to make a couple of other things to auction, but the cool tote bag with map of Rowan’s world (as of The Lost Steersman) got burned in the center while I was ironing on the transfer, so: not good enough for the auction. 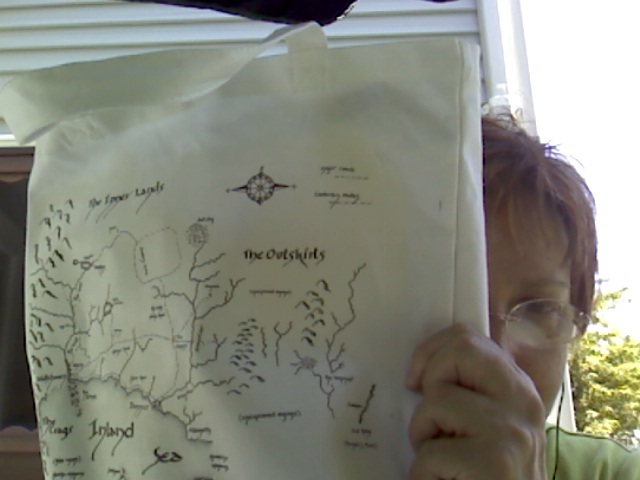 On the upside, I now have a cool tote bag with a map of Rowan’s world, slightly burned in the center, in which to tote my totables. There’s some great stuff out there, folks. Remember, this is an auction by SF and Fantasy pros and fans, to raise money to help my friend Deb Mensinger, wife of fantasy author Laurie J Marks. Deb needs a liver transplant, and there are extra expenses not paid by insurance. 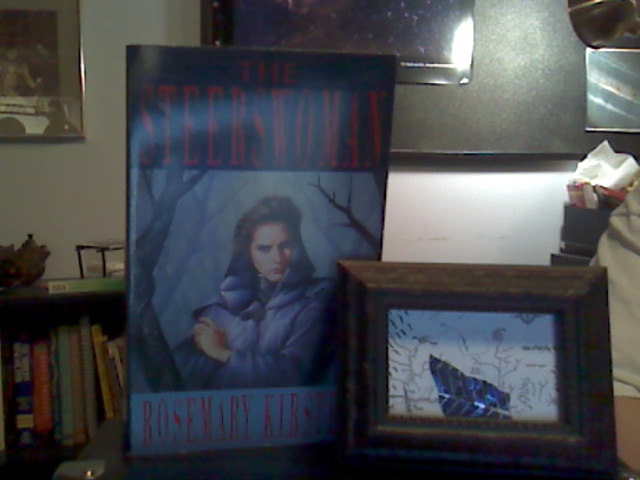 SO I put another item up: a copy of the Brit edition of The Steerswoman PLUS an actual example of the jewel (so-called, heh) from the book. The photo here is not so hot, I have no actual digital camera, just a webcam… But trust me, this looks cool. The “jewel” is in a black frame, against a miniature of the map from the book. No, you can’t buy it here! Go to the auction! There’s only a week left!